Tending paddy fields in Laos. The United Nations agricultural agency today unveiled guidelines to help Governments balance the needs of farming and climate change when making decisions, such as whether to refill a dried up lake or focus instead on sustainably using the forest on its shore. “Medium to long-term adaptation planning is crucial to build climate resilience and food security for future generations,” said Julia Wolf, UN Food and Agricultural Organization (FAO) Natural Resources Officer and co-author of the guidelines. “The agriculture sectors, often the economic backbone of developing countries, need to be a key driver and stakeholder. The guidelines are set out to address the key issues, entry points and steps to take,” Ms. Wolf said. Agriculture – including fisheries and forestry – are important in efforts to keep global temperatures from rising more than two degrees Celsius above the pre-industrial levels. The industry is a major source of greenhouse gas emissions. At the same time, to meet the food demand of a larger population, food production would need to be 60 per cent higher in 2050 than it was in 2006, said FAO. They are aimed at national planners, agriculture, forestry and fisheries authorities and experts as well as United Nations and bilateral donors. The guidelines are expected to help countries achieve the climate pledges made in December 2015 when the Paris Climate Accord was agreed to in France. 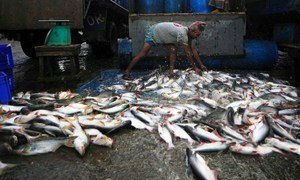 Harmful fishing subsidies that contribute to overfishing are estimated to be as high as $35 billion, fisheries experts from the United Nations trade and development agency today said, highlighting one of the key issues that will be debated at next month's Ocean Conference.